I don't know if any of you ever wake up with ideas in your head but I woke up with this one. I haven't found the perfect verse yet but here is the idea. Maybe you could use it sometime. 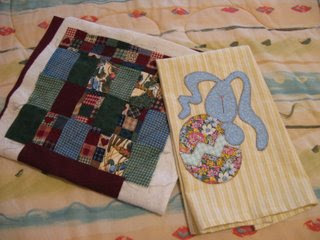 The pieces of the quilt or plain white cross stitch panel and some thread would work as well. When we are living our lives we often feel like these pieces we don't seem to fit together or look very or seem very useful but God has a plan and if we are patient we can sometime begin to see the plan. Like my quilt in process. I am beginning to look like something but what happens if I stop here. Will I be able to put anything my bag is it really pretty not finished (if using cross stitch use a partially finished project or one that has a pattern on it so they can see what it is to be like). But if we are patient and trust that God loves us and has a plan for us we can see what we can become. The two verses I had in mind at the moment are Isaiah 64:8 Yet, O LORD, you are our Father. We are the clay, you are the potter; we are all the work of your hand. or Jeremiah 29:11 For I know the plans I have for you," declares the LORD, "plans to prosper you and not to harm you, plans to give you hope and a future. Yes I know my picture is sideways. I forgot to flip it and can't figure out how to delete it and repost it. Enjoy the thought though and the bag is my finished diaper bag. 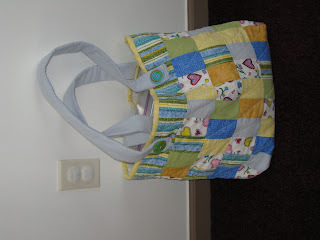 what a wonderful lesson and beautiful diaper bag! 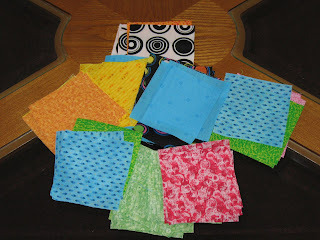 you are so good at that quilting!